Our managed services offer proactive management of your cloud applications including support, adoption, and governance. Our team can help your business achieve transformational results while ensuring predictable costs. 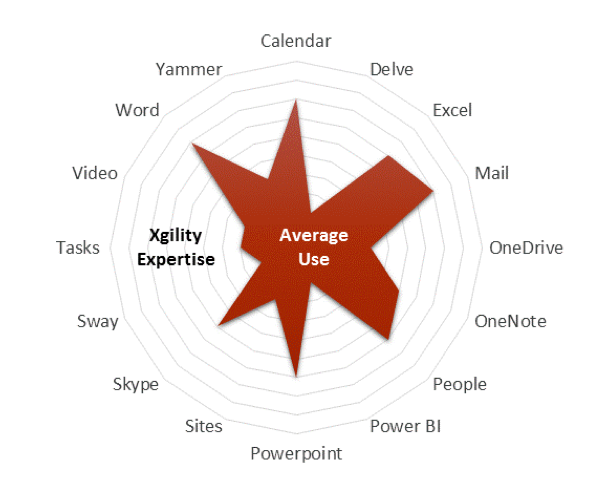 The Xgility team has a wide range of consultants with the skill sets needed for Office 365/SharePoint Success. In addition, we strongly believe in sharing our Office 365 expertise amongst our team, with the same collaboration tools we deploy in our customer deployments. Our team leverages collaboration tools to share knowledge and provide reach back/expertise for our customers on an as needed basis. The Xgility model for collaboration provides access to a team of experts, while reducing costs for your company having to staff each and every role. We provide monthly subscriptions and professional service agreements for the ongoing development, management, and optimization of your Office 365/SharePoint platform, based upon your organizations individual needs. Your investment in Office 365 gives your organization access to the same productivity and collaboration tools that major corporations utilize. Those tools have the ability to transform your business and increase the productivity, collaboration, and efficiency of your staff. Your organization may be able to afford an employee dedicated to SharePoint, but one team member cannot be and expert on all aspects of SharePoint. With Xgility’s Advisory Services for Office 365, your organization gets access to a team of experienced professionals that can help you remove the barriers to success and help empower your team get the most value from the tools available to them. Let Xgility help your organization take the next steps to transform your business by utilizing the software tools you already have to automate your business processes and give your staff more time to focus on activities that help you grow. Xgility professionals will help your team design automated processes and tools specific to your business. Not only will this free up valuable staff time, but it will allow you to track your processes. Adoption of new technologies can be tough for any business. Xgility will work with your team to educate and train your employees on these technologies and work with you to define successful outcomes and results. Get all the benefits of our Business Automation and Adoption Service while adding custom components specific for your business. This can include items such as support for custom developed applications or adding a full-time support from our staff of experts. Xgility can even serve as your full-time Intranet team. Why pay for one or two SharePoint employees when you can have a full staff of our experienced experts standing by to help your business succeed?